Those Saturday morning TV shows entertained Boomer kids, but they were also vehicles for brand advertising. Chances are that's how Boomers first got to know cereal, soft drink, and snack food brands. The "Boomer Brands" they knew and loved then, they remember to this day. Barry Silverstein is a Boomer, freelance writer and retired direct marketing/brand marketing professional. He is the author of numerous non-fiction marketing and small business books, including Branding 123 and The Breakaway Brand. He also writes a blog for Boomers called "Happily Rewired." Silverstein resides with his wife in the Asheville, North Carolina area. GuideWords Publishing publishes books at the intersection of Boomers and business. Boomer Brands is the company's second book. Its first book, Let's Make Money, Honey: The Couple's Guide to Starting a Service Business, is designed to help couples succeed in starting and running a small service business. Barry Silverstein is a Boomer, freelance writer and retired direct marketing/brand marketing professional. He ran his own direct marketing agency for twenty years and worked for other leading marketing agencies and organizations during a forty year marketing career. Silverstein is the author of numerous non-fiction marketing and small business books, including Business-to-Business Internet Marketing (the first book on the subject), Internet Marketing for Technology Companies, and The Breakaway Brand. He teaches an online course, "Big Brand Strategies for Small Brands." He also writes a blog for Boomers called "Happily Rewired." Silverstein resides with his wife in the Asheville, North Carolina area. 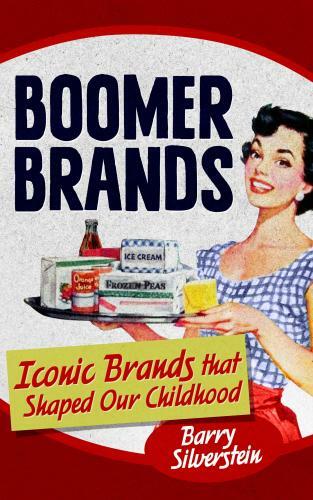 Boomer Brands is a delightful book filled with fun facts about our favorite childhood brands and memories. If you're over 50, you're sure to enjoy this nostalgic, entertaining and informative walk down memory lane.